It’s been awhile since I’ve posted. Not being that sick anymore has given me the opportunity to be more active, which means less time for writing. For those who don’t want to wait and want to know how I am doing: just call or mail. As usual it has been a very fun and intense ride that last months. I wonder if that is just the way I operate? I was in Barcelona at the Mobile World Congress a couple of weeks ago to launch Zcapes, the second company me and my SPRX partners launched there. I was a bit nervous for the trip because I didn’t know how I would manage. Normally a trip like this would involve lots of activity, little sleep and a very intense time. Would I be able to keep up? Would I be able know when it is done and go to bed in time. Well, I did. I had a great time, met great people and got lots of inspiration too. The Barcelona trip turned out to be a turn around for me. I got a lot of physical confidence back. And that’s good. Getting the confidence back is big, also because I didn’t really know it was gone. I just knew that I didn’t know what I was capable of. Normally you know how you physically are with any kind of activity. After chemo I lost that knowledge. I didn’t know if i would get tired or not. Experiencing and gaining back the knowledge and confidence gave me a huge confidence boost. The launch of Zcapes went very well and was fun. As a gimmick we handed out over 350 ‘Z’ chocolate letters which was a huge success. We got some good PR which was our goal. I did bring back a cold and was a bit sick when I was home again. The week after Barcelona I went to the LIFT conference in Geneva. The conference was themed around the question “where did the future go?”. The first day consisted of workshops in which I participated. It was great thinking freely and creating new concepts and idea. There is even a short video. The next two days were presentations by lots of inspiring people including the ‘father of the internet’ Vint Cerf who, as he already built the current internet, is ready with an interplanetary one and is now working on an inter galaxy internet…. seriously. The workshops, the presentations and the new and old crowd (amongst them being @michielb and @vangeest) made this into best best event I have attended to date. I was able to enjoy it because of my new found physical confidence. The evening events I didn’t miss though. The first one was a cheese fondue with all 700 participants. The second one was the party in a club. It was good to be back in a club 8-). Both nights I did get to bed early. I do like that now, going to bed early. Because of that I also enjoy the day after wards. Saturday the event was over and I went to the antique market. 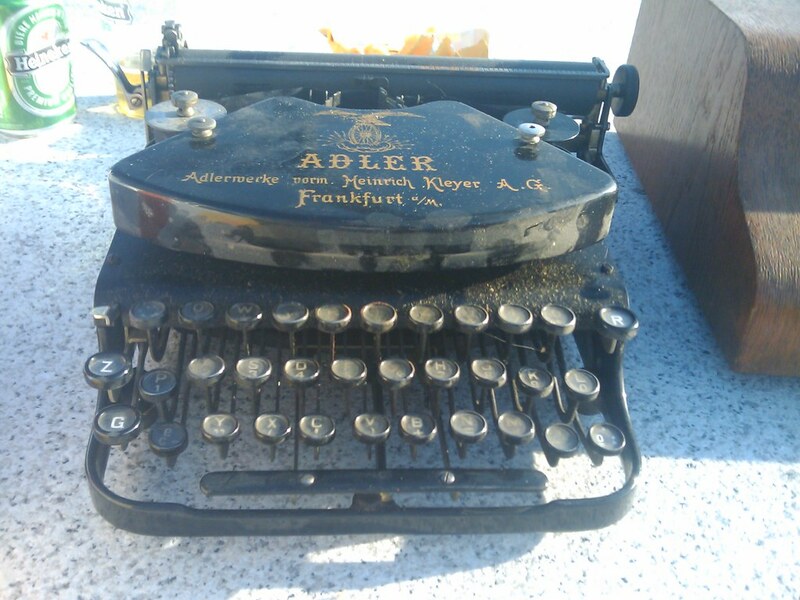 The weather was amazing, sunny and almost not cold too 😎 At the market I found a great Klein-Adler type writer from around 1920. It has a nice steampunk feel and works too. I was able to come home with it because I bought Lori a ring. My hair is getting curly and Lori loves it. It used to be straight. I still do sports at least once a week which is very good. I lost almost 5 kilo’s too. The other day i tried to start cardio training. 3 times 4 minutes cycling at top speed. That was tough. I was out for almost a day. So still not totally back but I’ll get there. Friday March 20th I’ll have my first checkup scan. The Wednesday after that, March 25th, I’ll have the results. I am nervous for that. We are sooooo HAPPY to hear how well you are doing. Your trips sounds wonderful! Pictures of you are very handsome. LOVE your curly hair. Keep taking good care of you. Love & Hugs to you and Lori. Vroeg me vanochtend ineens af wanneer je je volgende checks zou hebben – en hier stond zomaar het antwoord… Erg spannend. Ik meld me binnenkort weer eens via Skype in de SPRXmeeting, met kleintje op de arm! Life is good Maarten and we love your curly hair! You look better than ever and it has been so fun following all your adventures. It looks like you are having a fabulous time growing your new business and traveling to lovely places. Tony and I send our love always………. Its great to hear that you have launched your second company, also take care of your health. Please update after your CT scan check up. Great news about the CT scan. Dude, I am envious of your curls. My hair came back straight (just as before) and was rather straw-like for the first year.